A Jordanian youth named Omair comes from the poorest area in Jordan. Several years ago he failed grade 12, which left little option for bridging back into the academic system or into the workforce. He had been without a job for two years and was desperate to help support his family of five siblings and his retired parents. Ms. Abu-Jaber stresses that “… economic inclusion of young people is necessary for the progression and development of society. The training was conducted using a corporate engagement model, with the participation of fourteen Jordanian media and communication organizations that offered fifty pro-bono corporate trainers to train the students. And in addition, each afternoon, the media fellows were linked to renowned international speakers worldwide who shared their knowledge and experience. Omair’s contribution to society does not stop there. 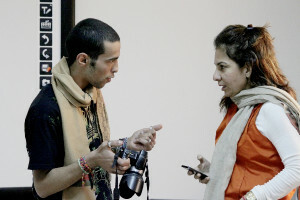 “Our media fellows,” Ms. Abu-Jaber says, “deliver monthly one-day training programs to other youth fellows. These training sessions are focused in remote areas of Jordan. Youth exchange their knowledge and create Facebook pages to share their experience. “So far, our media fellows have conducted two trainings in the north and will be duplicating a similar training program in the south. JCEF is part of a broader initiative. Ms. Abu-Jaber says, “JCEF is an affiliate of the Education for Employment (EFE) and part of the EFE network operating in Jordan as well as Palestine, Yemen, Egypt, Morocco, and Tunis.” JCEF will be able to duplicate a similar model through the EFE network to achieve a greater voice for youth via social and new media to support their country and their commitment to employment. The bottom line: JCEF believes that every young person deserves an opportunity to get a job so that they may establish sustainable livelihoods. Learn more about the Media Fellowship Program. Here is the mission statement for JCEF. And here are the 2013 graduates of the MFP course.